Antarctica has always been a mysterious place to all of us. Thoughts of Antarctica bring forth images of snowy, icy landscapes, magnificent glaciers, frozen tundra, and mystical northern lights. Antarctica is a place I’m forever curious about, but probably may never get to see in person. 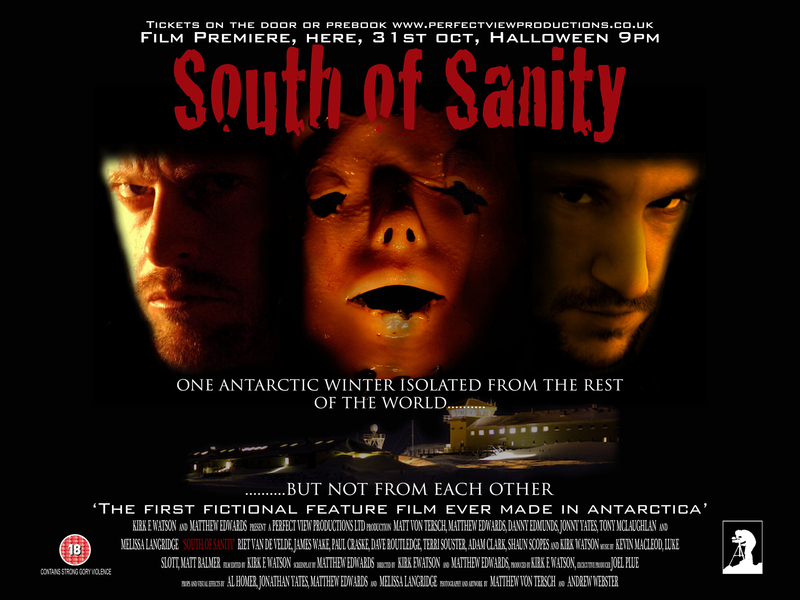 It is no surprise then how excited I was to hear about the independent film South of Sanity, the first fictional movie to film entirely on location in Antarctica. Released worldwide on Halloween this year (today), South of Sanity is a British film styled similar to the American horror film The Blair Witch Project. It follows everyday life on an Antarctic research station. Everyday that is ... until something goes horribly wrong as 14 workers are holed-up on an isolated station for nine months. During the investigation, the rescue team’s only clue as to what had happened is from a diary found much later. Before we talk more about the film, let’s briefly visit Antarctica. Being the fifth largest continent (5.4 million square miles) after Asia, Africa, South America and North America, Antarctica is almost twice the size of Australia. With a population of maybe 4,400 in the summer and 1,100 in the winter, Antartica is considered a no-man’s land, unclaimed by any nation (according to the 1959 Antarctic Treaty). Having said that, crimes committed in Antartica (such as the ones portrayed in South of Sanity) will be tried and sentenced. For example, according to Article 8 of the 1959 Antarctic Treaty, British law would apply at the British research station. Considered as mostly desertland, 98% of Antarctica is blanketed by ice averaging at least one mile in depth. The continent is the coldest, driest, and windiest of all continents. In the winter, it gets as cold as −89 °C (−129 °F). With extreme weather such as this, there are no human residents permanently living on the continent. The 1,000 to 5,000 folks residing there throughout the year work at research stations scattered across Antarctica. And with that, friends, let’s move on to the story behind how it all happened for South of Sanity. 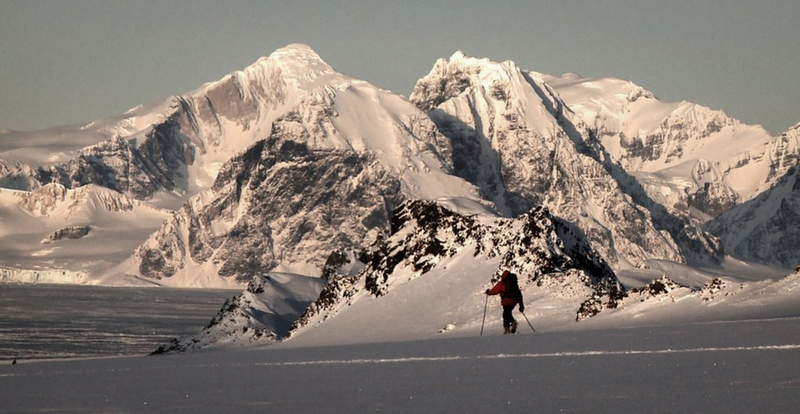 South of Sanity’s director Kirk Watson in real life is a mountaineering expert. For almost eight years now, Watson has worked as a guide at the Halley Research Station (a British Antarctic Survey (“BAS”) base) where he leads scientists across glaciers and mountains, looking out for their safety. PHOTO CREDIT: Image of Kirk Watson, director of South of Sanity via Google. During the summer months, things are busy at the base and the work hours are long. But comes winter, activities slow down. The work days are mostly nine-to-five and everyone has more time to pursue his or her own personal interests. Some tries to learn a new language or play the guitar. Others get involved in woodworking or black and white photography. Watson (a documentary filmmaker in his spare time) made South of Sanity during these free winter evenings and weekends. PHOTO CREDIT: The above photo is a screenshot from South of Sanity. In the summer you don’t have any spare time, you work very long days helping with the science as the daylight lasts for 24 hours. But it becomes dark in winter, the staff numbers drop – there were only 21 of us in the station in the winter – and once you finish work you have lots of free time. You don’t have to commute home, go to the shops, mow the lawn, and there isn’t much of a social life. To fill in their free time some people learn the guitar or other musical instruments, or get into photography or learn a language. I learned to make films in my free time over almost six years in Antarctica and that culminated in my last winter, where I decided to move it on a bit. He [Edwards] wrote it and I filmed it, and it turned out to be a really good project. It filled in a lot of spare time for everyone there. We didn’t have actors as such but the fact that they knew each other so well meant they could act out in front of others and not get embarrassed. They were also extremely used to me having my camera with me all the time, so they just did their best. The cast (all 14 of the actors including Watson) consists entirely of Watson’s colleagues and co-workers at the station—Marine biologists, geologists, doctor (Edwards) and mechanics, all without any real acting experience. With their jobs being mostly nine-to-five with weekends off and one week of vacation each year (on an 18-month contract), they were able to put together this incredible film. ... to the interior scenes such as the one below where six of the 14 people (and soon to be victims) are having breakfast. PHOTO CREDIT: The above three images are screenshots from the movie. The top 2 show exterior shots of the base where the workers are staying and working through the winter. The above image is of an interior scene where six of the 14 people wintering at the Antarctic research station have their breakfast around a conference table. Since in real life everyone involved in the movie got along well as a group, it was difficult for them to act as if they hated each other in the film. But on the other hand, working in a tightly-packed and isolated environment has a few perks. All the actors knew almost everything about each other. They trusted one another completely and so acting in front of each other was easy. PHOTO CREDIT: Photo of the cast and crew of South of Sanity - via BBC News. With a few years under his belt for documentary filmmaking, Watson enjoyed the process of making South of Sanity with his friends and colleagues. “In the winter we have some free time and a project like this is perfect to give people a bit of entertainment and some aims outside day to day work,” said Watson. “It’s unlike after you finish your job in the UK, where you have to go shopping for groceries or mow the lawn. There is none of this in Antarctica so we filled some of it making this film. We filmed a couple of day scenes on a weekend and the rest was shot in the dark just to make the film darker. So our actors suffered a bit in the cold as we had people sitting outside for ages, or playing dead people lying in the snow. It became a bit tricky with the ‘dead people’ as they shivered, so they were carefully edited to get rid of the movement. We had several actors with mild hypothermia during the filming. The good thing was they had lived there for a year, so were pretty used to it. PHOTO CREDIT: The above is a screenshot from the movie. Even though Watson filmed most of the movie during the dark winter evenings and weekends, he soon came upon another weather-related problem. As the end of the winter was quickly approaching, the sun slowly made its way back to give Antarctica its 24-hour daylight season. Watson and his cast and crew had to work later and later into the night to complete the movie. Since the budget for South of Sanity was a shoestring one, they only had one camera to film the movie with. That meant each scene could only be filmed from one angle at a time. The non-existent budget also meant they had be more creative. In addition to directing, Watson also doubled as make-up artist for the movie, mixing food coloring with children’s face-paint, flour and syrup to create the bloody effects on the film’s victims. If you’re interested in finding out more about life at a research station in Antarctica and getting news and updates on the movie, follow Director Kirk Watson’s blog and/or South of Sanity‘s Facebook page. With South of Sanity, Watson and Edwards have made an enormous contribution to the history of films. 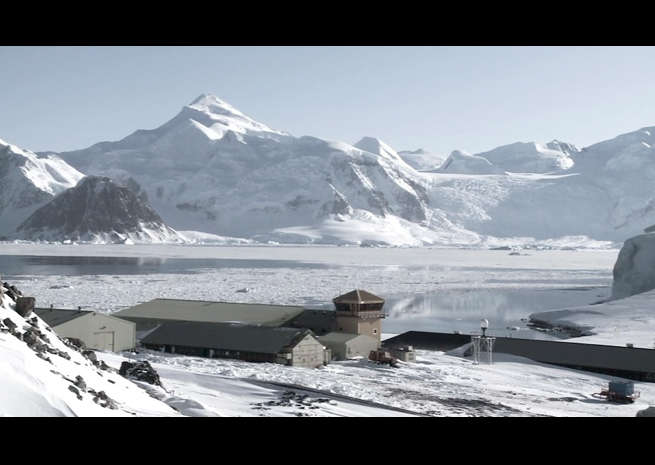 In addition to being the first horror film made entirely in Antarctica, South of Sanity is also the movie featuring the most unique filming locations in cinema history. No other fictional movies have ever been filmed in Antarctica. In South of Sanity, we will see for the first time some of Antarctica’s most remote and breathtaking filming locations. Up to now, it has been impossible even for a major Hollywood studio to even think of filming a few days in Antarctica. The tremendous cost and danger involved alone are enough to hinder such projects. 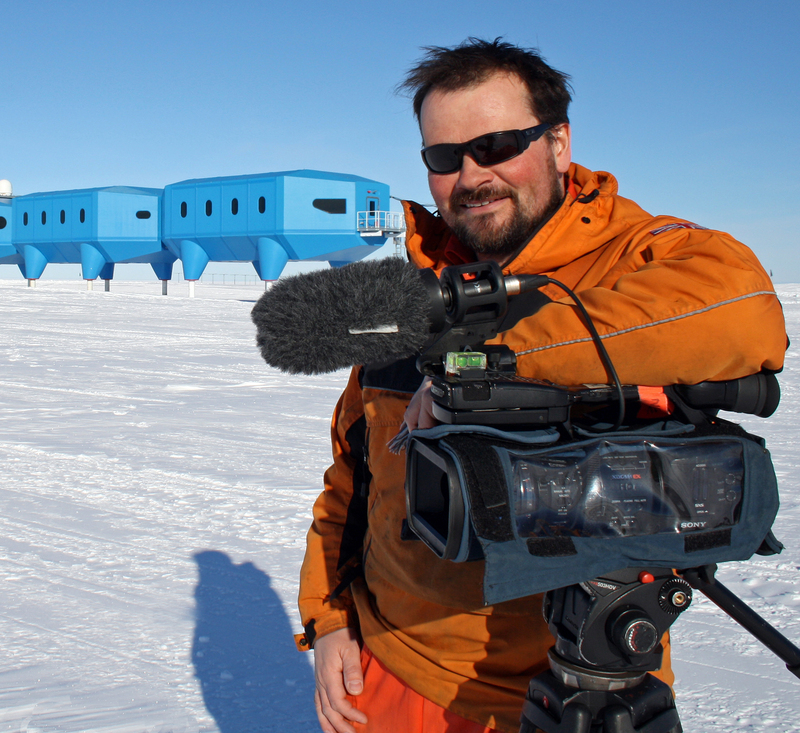 With their unique situation working on a research base in Antarctica, Watson and Edwards are at a vantage point, way ahead of everyone else in the industry on the film location front. Although Antarctica has never been a film location for a fictional film before, it has been the the setting for many movies in the past. The Lost Zeppelin, a movie based on the crash and rescue of the airship Italia near the North Pole in the late 1920’s, was filmed on Hollywood sound stages in 1929. Two years later, Frank Capra made Dirigible, a film about another airship’s race to the South Pole. In 1965, Quick Before It Melts was a comedy about a reporter and a photographer’s involvement with women, marriage, and a defecting Russian scientist while on an expedition to Antarctica. And more recently, two terrific 2006 films also claimed the icy continent as their setting. Happy Feet’s penguins entered the scene as the first computer-animated film entirely set on Antarctica. And my personal favorite ... Walt Disney’s Eight Below tells the story of two Antarctic explorers who must leave their team of sled dogs behind as they fend for their survival in a snow storm. Even though the setting is again Antarctica, Eight Below was filmed in Canada, Greenland and Norway. PHOTO CREDIT: Image of Paul Walker and his beloved huskies from Eight Below via Google. But everyone who’s familiar with the horror genre will immediately recognize after watching South of Sanity that it seems eerily similar to John Carpenter’s The Thing, a 1982 horror film about a group of scientists in Antarctica as they confront a shape-shifting alien that assumes the appearance of its victims. PHOTO CREDIT: Above is a photo of Kurt Russell in John Carpenter’s 1982 “The Thing” - courtesy of IMDB. Being a classic film means people will try to reshape and remake you for the next generation. There is now a 2011 remake of The Thing, the setting of which is also - you guessed it - Antarctica. It has garnered tremendous press coverage in the United Kingdom and is already attracting media attention in North America. Plue’s goal is to create an “Antarctica movement” by working on projects with the people who work and live on the continent. In the past, documentaries have featured the lives of penguins and glaciers, but the transcendent, magnificent natural landscape of Antarctica has so much more to offer as a film location. PHOTO CREDIT: The above is a screenshot of the buliding where the workers work and live during the long winter months. Lucky for the rest of us, South of Sanity is now available on DVD from Amazon.com ($19.99) with one-day shipping available. Plue plans to distribute South of Sanity via iTunes in early 2013 along with Amazon Instant Video, Flixscene and Xbox Live. I ordered my copy of South of Sanity a few days ago from Amazon. The DVD was supposed to arrive last Monday, in time for me to give you a personal review about it in this article. But with Hurricane Sandy, the delivery date has now been postponed to sometime in the near future. I’m not a huge horror movie fan, but I’m totally intrigued about this first movie filmed in Antarctica, especially after seeing its trailer. I’d love to see Antarctica up close and personal. I’d love to see how a cast with not much acting experience came together to make a featured film in the most remote filming locations on Earth. I’d love to see the little indie movie that makes cinema history.